WIRE DOUBLE-HEAD NAIL MACHINE К23.2.16-0.8 is designed for manufacturing double-headed nails for assembling and disassembling of wooden joinings. General purpose low-carbon steel wire, not treated with heat, with ultimate strenght of 800 MPa, in bundles or reel s weighing up to 1000 kg. WIRE DOUBLE-HEAD NAIL MACHINE is a high-speed horizontal press designed according to the classical three shaft layout. The shafts are joined together with cone gears. The basic mechanisms are mounted at the bed frame made out of high -strenght cast iron. The drive contains a separate electric motor and is rack-mounted . Nails are manufactured in die - cutter space . Two nail heads are simultaneosly made therein, ready nail being subsequently cut off and released into flute . During one travel of the heading slide one nail is made. • WIRE DOUBLE-HEAD NAIL MACHINE is delivered with a package of spare quickly worn details and completed with the instrument for maximal diameter of a wire with which the automatic machine passed production tests. The instrument on other standard sizes of a nail is delivered at additional expense. 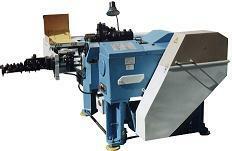 • At additional expense the WIRE DOUBLE-HEAD NAIL MACHINE is completed with the device for a unwinding of wire РУ31А. • The enterprise realizes service during all period of maintenance of an automatic machine.